A kidney* stone is a solid piece of material that forms in a kidney when there are high levels of certain substances in the urine. These substances are normally found in the urine and do not cause problems at lower levels. 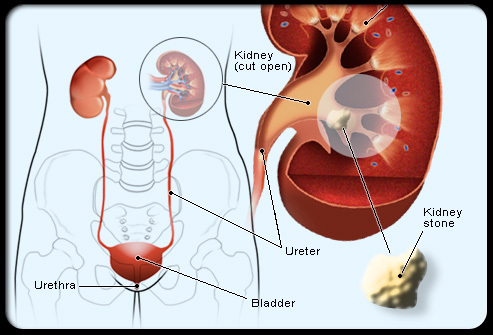 A stone may stay in the kidney or travel down the urinary tract. Kidney stones vary in size. A small stone may pass on its own, causing little or no pain. A larger stone may get stuck along the urinary tract. A stone that gets stuck can block the flow of urine, causing severe pain or bleeding. The urinary tract is the body's drainage system for removing wastes and extra water. The urinary tract includes two kidneys, two ureters, a bladder, and a urethra. The kidneys are two bean-shaped organs, each about the size of a fist. They are located near the middle of the back, just below the rib cage, one on each side of the spine. Every day, the two kidneys process about 200 quarts of blood to produce about 1 to 2 quarts of urine, composed of wastes and extra water. The urine flows from the kidneys to the bladder through tubes called ureters. The bladder stores urine until releasing it through urination. When the bladder empties, urine flows out of the body through a tube called the urethra at the bottom of the bladder. You may also be more likely to get a kidney stone if you don't drink enough fluids or if you take certain medicines. The most common types of stones contain calcium. Calcium is a normal part of a healthy diet. Calcium that is not used by the bones and muscles goes to the kidneys. In most people, the kidneys flush out the extra calcium with the rest of the urine. People who have calcium stones keep the calcium in their kidneys. The calcium that stays behind joins with other waste products to form a stone. People can have calcium oxalate and calcium phosphate stones. Calcium oxalate stones are more common. A uric acid stone may form when the urine contains too much acid. People who eat a lot of meat, fish, and shellfish may get uric acid stones. A struvite stone may form after you have a kidney infection. Cystine stones result from a genetic disorder, meaning a problem passed from parent to child. The disorder causes cystine to leak through the kidneys and into the urine. Kidney stones vary in size and shape. Stones may be as small as a grain of sand or as large as a pearl. Some stones are even as big as golf balls. Stones may be smooth or jagged and are usually yellow or brown. Kidney stones vary in size and shape. These stones are not actual size. The pain may last for a short or long time. You may have nausea and vomiting with the pain. If you have a small stone that passes on its own easily, you may not have symptoms at all.